I have a Kiwi plant, I think it is self fertile. It's been in its permanent position for l year. We had a lovely growth covered in flowers. They lasted for a long time, but then just gradually dropped off, never turning to fruit. What might be the reason, please. 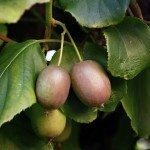 It is necessary to have a male and female Kiwi Vine. Here are some links to help you.